LIC Jeevan Labh – Plan 836 – All details with premium and maturity calculators. LIC’s Jeevan Labh (T 836) is an endowment type of plan with limited premium payment period. Jeevan Labh is one of the most popular insurance plans and is also considered as one of the best insurance policy from LIC of India. One of the reasons behind the popularity of LIC’s Jeevan Labh (Plan 836) is the high maturity returns and low ‘total premium payment‘ compared to the Sum Assured. The plan becomes even more attractive with optional riders like Accident and Disability Benefit, Additional Term Insurance, Critical Illness Rider Benefit etc. What are the benefits of Jeevan Labh Policy? Jeevan Labh – Maturity Benefits. Jeevan labh – Risk Coverage. LIC’s Jeevan Labh (836) is an Endowment type of plan, where the maturity amount is given as a single lump sum amount after completion of the term. Maturity amount of Jeevan Labh includes Sum Assured, Vested Bonus and Final Addition bonus (if any). Normal insurance coverage will be the sum of ‘Basic Sum Assured’, plus the ‘Bonus Accrued’ in the policy. Critical Illness Rider Benefit which covers major critical illnesses is available as a rider under this plan. Loan facility shall be available after the completion of three years and on payment of three full years premium. You can select the Term and Premium Paying Term for the plan as per your needs. Benefits such as insurance coverage, bonus etc. shall be available throughout the term of the policy but you need to pay premium only for the limited premium period mentioned above. At the end of the term the policy matures and you will get a maturity benefit. Maturity benefits includes following factors. The benefits under Jeevan labh plan are listed below. Premium of Jeevan labh plan is considerably lower compared to the sum assured of the plan. A comparison of total premium paid vs maturity benefit is provided below. Maturity benefit of LIC Jeevan Labh policy in various situations are explained here. On Completion of the policy term, Sum Assured along with vested bonus + Final Addition Bonus (if any) shall become payable provided all the premiums for premium paying term have been paid fully. For policies where at least 3 full year premiums are not paid, nothing will become payable as maturity benefit. In other words, a lapsed Policy should have acquired paid-up status by paying at least 3 full years premium to become eligible for maturity benefit. Such policies are called paid up policies and shall be eligible for reduced benefits based on the paid up value of the policy. Paid up value can be calculated using the formula given below. He will be eligible for a maturity benefit which includes the paid up value of 2,81,250 and accrued bonus at the time of maturity. Insurance benefits of Jeevan Labh will commence immediately on completion of the policy. Death coverage available in the policy is the sum of “Sum Assured on death” and the “Accrued Bonus”. 105 % of all the premiums paid as on date of death. Following riders are available under Jeevan labh plan. AD & D rider can be opted at the time of purchase or at any policy anniversary thereafter, provided, the outstanding premium paying term is at least 5 Years. As this rider is not available for a minor he can add this rider after attaining 18 years of age. Maximum sum assured under accident rider shall be one crore or Sum Assured of the policy whichever is lower. Term rider provides, “add-on coverage” over and above the sum assured of the policy, equal to the opted term rider sum assured. Maximum Term rider sum assured shall be less than 25 lakhs or sum assured, whichever is lower. On opting CIR rider, the policyholder gets a coverage equal to CIR Sum Assured for fifteen pre-specified critical illnesses. Read complete details of LIC’s Critical illness Rider with Critical Illness Rider (CIR) calculator. Jeevan Labh plan as all other endowment plans follows E-E-E model as far as income tax implication is concerned. Premium paid – The premiums paid shall be exempted from income tax under section 80C of Income Tax Act. Maturity Amount – Maturity amount is exempted from income tax u/s 10(10D) of the Income Tax Act. Death Claim – Death Claim amount received by the nominee shall be exempted from income tax u/s 10(10D) of IT Act. Policy can be surrendered any time before maturity provided at least three full-year premiums have been paid and the policy has acquired a paid up value. It is advisable to consider the following facts before surrendering a policy. You are losing valuable insurance coverage and that too taken at a lower premium as the policy was started several years ago. Surrendering of Jeevan Labh plan can bring in a loss as the surrender value can be lower, especially if the premium paid period is for a shorter period. If your policy has lapsed and you are unable to revive your policy, a better option is to keep the policy as paid up and get the maturity amount after the end of the term. You will have insurance cover based on the paid up value and full accrued bonus along with paid-up value of the policy can be availed at the time of maturity. Jeevan Labh – premium and benefit Calculator is a powerful online calculator to provide complete idea on premium, maturity and insurance coverage benefits, in a simple and user-friendly manner. Riders such as Critical Illness Benefit Rider (CIR), and Accident and Disability Benefit (DAB) has been incorporated in to this calculator. If you are unable to view the Jeevan Labh – calculator here (This can happen if you are viewing this page from a mobile device) Click to open Jeevan Labh – Premium and Benefit calculator. In order to understand the benefits of the plan an info-gram is provided here. In this example the Sum Assured is taken as 20 lakhs and Plan and term considered is 25/16. Download LIC Jeevan Labh Infogram. Jeevan Labh is a participating policy where profit of LIC of India is shared in the form of bonuses and get added to the policy account. Jeevan Labh plan can have two types of bonuses. Final Addition bonus: which is added as a one time lump sum amount at the time of matruity. Labh means ‘Profit’. And naturally, everyone will be curious to know how much rate of returns Jeevan Labh policy can offer. I have calculated the internal rate of returns of Jeevan labh plan based on current bonus rates. Normal premium and premium after removing the risk premium was used to calculate the internal rate of returns separately. Term rider premium of Jeevan labh was used to arrive at the risk premium of the plan. In order to get a clear idea on the benefits of Jeevan Labh Plan, let us take an example of a person with following details and assume that he is taking a new policy. Please note: Illustration shown here is just an example to understand the benefits of Jeevan Labh Policy, If you want to know the actual benefits as per your details, please use the Jeevan Labh – Calculator provided above. If death occurs before the completion of the policy term, normal life coverage is paid to the nominee. Normal Life coverage includes the basic Sum Assured + Bonus accrued till date + Final Addition Bonus. If the death occurs due to an accident, an additional basic sum assured is paid along with the normal life coverage. The table provided here will help you to get a clear idea on the insurance coverage, surrender value, expected loan, Income tax benefit etc. available on various years. 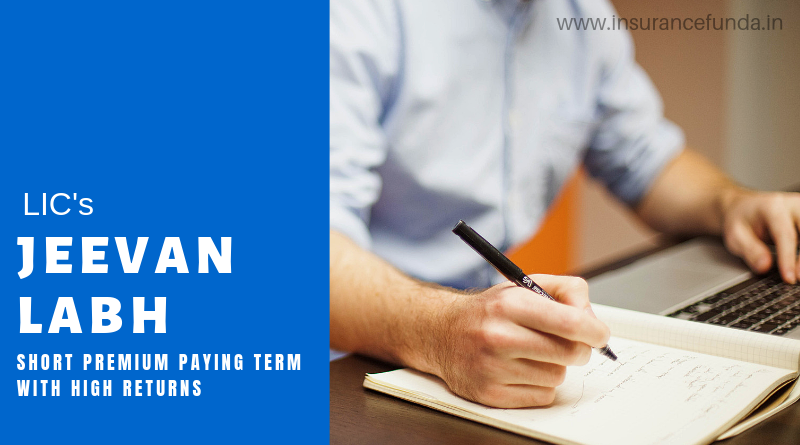 As the premium paying term is lower than the term of the policy, this plan is mainly advisable to people with higher income in the initial period. People with uncertainty in continued income for a long period and people who do not want to continue the premium for long period can also go for this plan. It is generally suitable for Non-Resident Indians (NRIs) as the premium will not be a burden even if they are returning home after a period of time. The longer term of the policy will provide the policyholder with insurance for a longer period which is always desirable. And further to add, the longer term policy will naturally fetch higher returns at the time of maturity. This plan can also be used to meet the children’s marriage or educational expenses if the policyholder has young children. LIC offers few other limited payment plans also such as Limited premium Endowment Plan, Jeevan Lakshya, Money back plans etc. Following table is intended to provide you a comparison on the limited payment policies of LIC. This is a question I come across very often at InsuranceFunda. In fact, Both Jeevan Anand and Jeevan Labh are good policies of LIC of India. The benefts and purpose of these two plans are entirely different. While Jeevan Labh offers good returns with low total premium, Jeevan anand provides a unique benefit of Life long coverage. Read more on benefits and features of Jeevan Anand Plan. *Benefit Illustrations provided here are as per the latest bonus rates declared for the policy. Final Addition rates used are based on the experience in similar plans. please read the documents provided at LIC web site for more information.